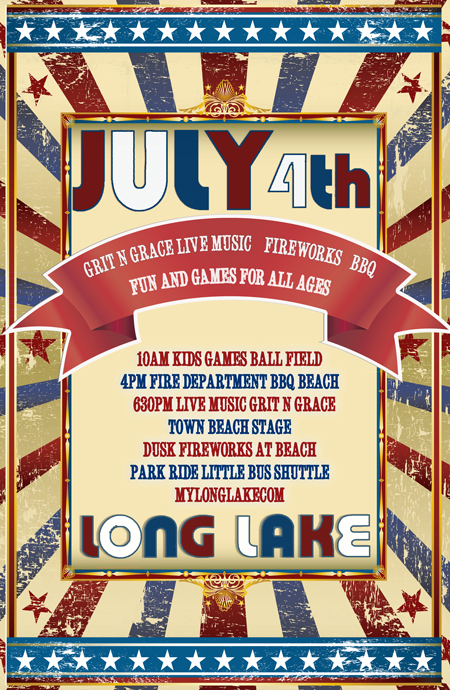 On July 4th the Town of Long Lake will be hosting traditional games and activities starting at 10 a.m. at the Long Lake Ballfield located at 1167 Main Street. First up will be two activities for children ages 5 and under followed up with the Games for All Ages. 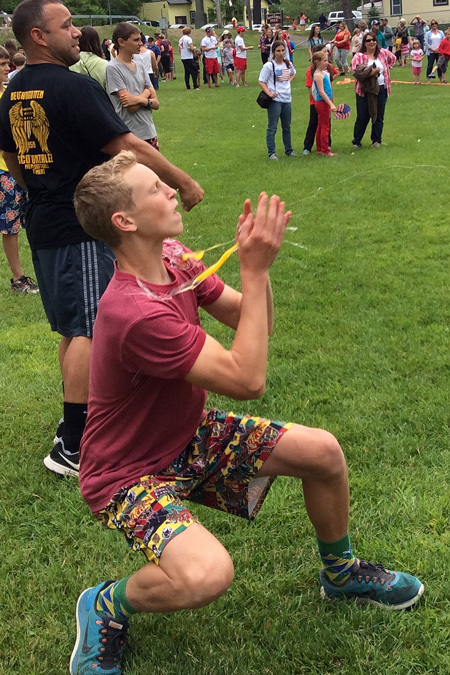 Games include 3-Legged Races, Sack Races, Hula Hoop Competition and the Egg Toss. The Long Lake prize booth offers trinkets for all ages winning the top three of their heats. All participants in the Egg Toss receive a free ice cream cone. The Long Lake Town Beach at 1258 Main Street will be the site of the evening festivities. Penelope the Clown will be in the beach gazebo painting faces and creating animal balloons. The Long Lake Fire Department will be selling raffle tickets for their ATV and serving up sausage and peppers and hot dogs. Folks are invited to come down to the beach with lawn chairs, blankets and enjoy the late afternoon. 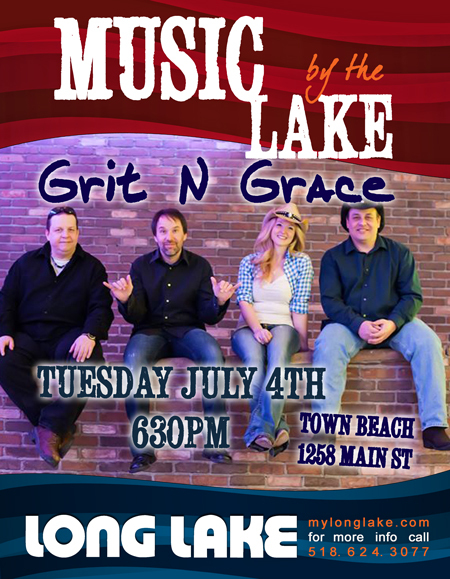 At 6:30 p.m. Grit N Grace from Syracuse, NY hits the stage. Featuring Jackie Pop on vocals, Dave Brown, formerly of the Fulton Chain Gang, on guitar and vocals, Bob Lett, bass and vocals and Frank Hanyak on drums and vocals. 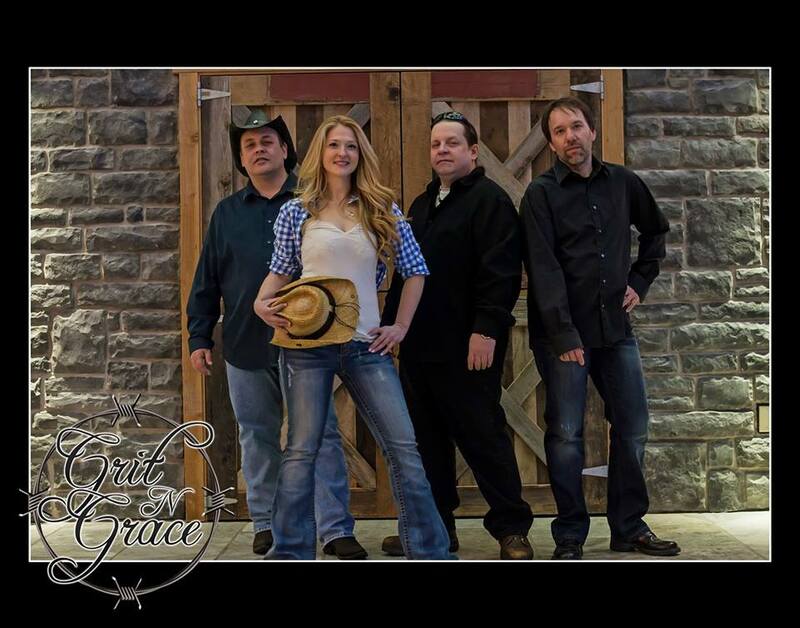 Grit N Grace is a modern country dance band playing music of: Miranda Lambert, Blake Shelton, AC/DC, Little Big Town, Cheap Trick, Sara Evans, The Cars, Allman Brothers, Gretchen Wilson, The Who, Carrie Underwood, Dixie Chicks, Dierks Bentley, Johnny Cash, Kid Rock, Lynyrd Skynyrd, Trick Pony, The Band Perry, Rascal Flatts, Darius Rucker, Luke Bryan, Big & Rich, Lady Antebellum, Allison Alison Krauss, Martina McBride, Florida-Georgia Line, The Henningsens, Alan Jackson, Taylor Swift, No Doubt, Chris Young, Jason Aldean, Patsy Cline, Vince Gill, The Doors, Joan Jett and the Blackhearts, Stevie Nicks, Pistol Annies, ZZ Top, and more. Fireworks are slated for dusk, approximately 9:30pm in Long Lake, overlooking Jennings Park Pond, across from the Long Lake Town Beach. 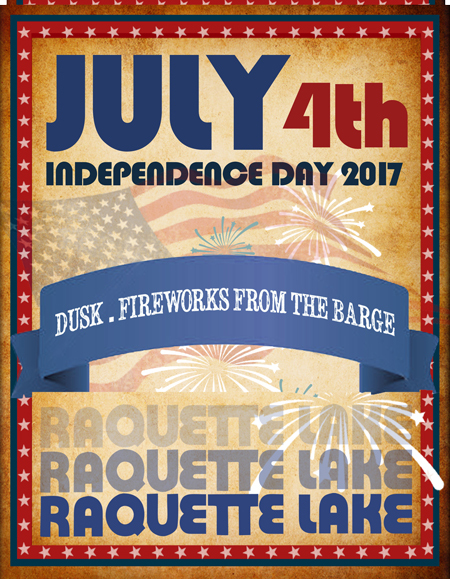 Fireworks from the barge can be seen in Raquette Lake on July 4th. Fireworks support is made possible by a generous contribution by Mrs. Mary Lou Whitney and John Hendrickson and Whitney Industries. Additional thanks to the Long Lake and Raquette Lake Business community for their support of the 4th of July fireworks: Hoss’s Country Corner, Britton Enterprises, Stewart’s Shops, Mt. Sabattis Lodge, Order of Eastern Star Abenaque Chapter 745, Dr. Russell Rider, Dr. Gregory Gachowski, Long Lake Camp for the Arts and Long Lake Adventure Camp, and Raquette Lake Navigation. 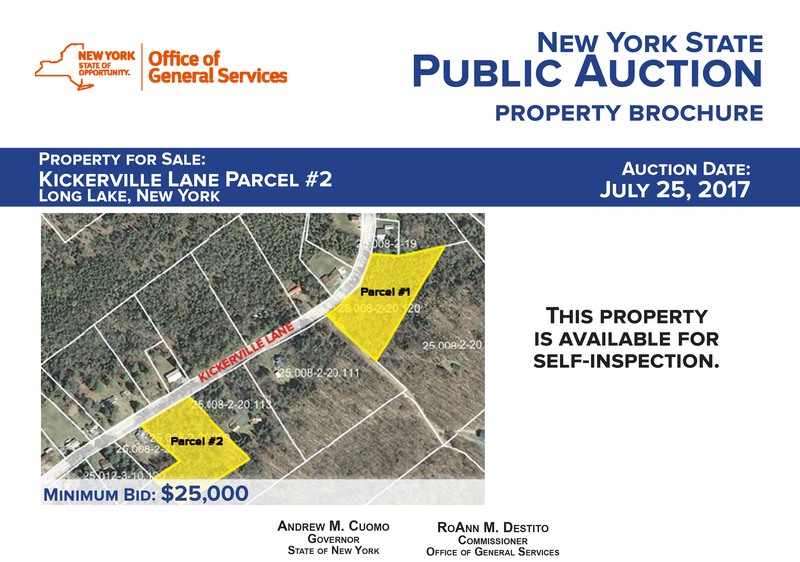 The State of New York is having a property auction in the Town of Long Lake on Tuesday, July 25th, 11 a.m. at the Long Lake Town Hall, 1204 Main Street, Long Lake, NY, 12847. Two parcels are available. Click on the links for details regarding the auction. 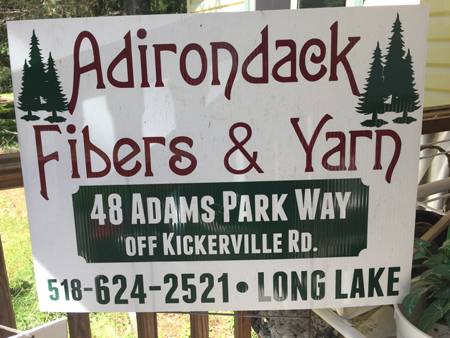 Just in time for Adirondack Quilt Camp it’s time to open the window on Adirondack Fibers and Yarn Shop located on Adams Park Way off of Kickerville Road. Hey, you never know what you’ll discover in Long Lake, NY! “If you’re anything like me when you have an idea for a project you want to do it RIGHT NOW!! I don’t want to have to wait until the weekend when I can get somewhere that sells the stuff I need, I want to start (and usually finish) it in that moment. Over the winter I picked up crocheting again after a few years hiatus. I had some yarn laying around to make hats out of, I borrowed yarn from friends and eventually had to get out of town to buy more yarn. 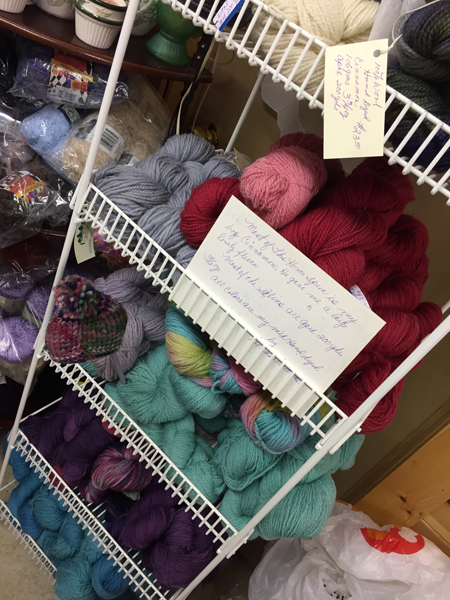 Little did I know I didn’t even have to leave Long Lake to get material, we have our own yarn and fiber store right here in town! 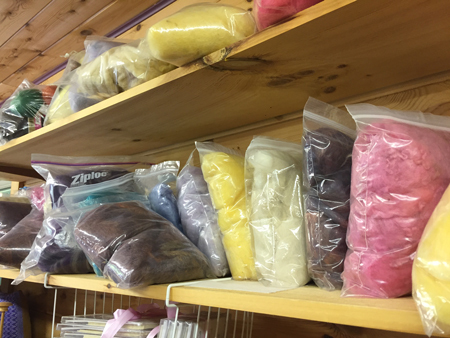 Adirondack Yarn and Fibers is located on 48A Adams Park Way, just off of Kickerville Rd, and it has IT ALL! You want to crochet? You got it! You want to knit? You got it. 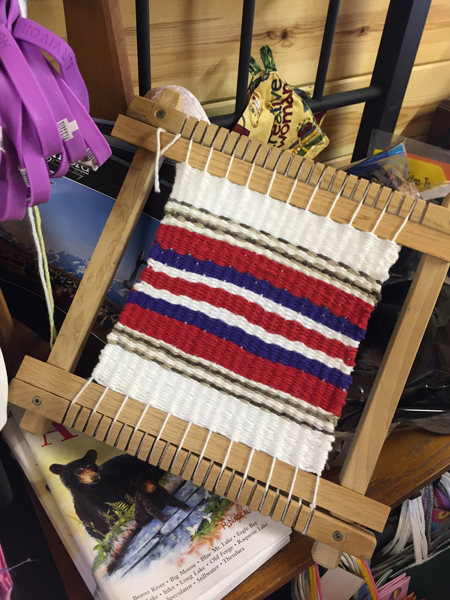 You want to weave or even make your own yarn? You can do all of that. Donna Adams is an avid knitter, crocheter and weaver who not only sells yarn, but made her own yarn (and it’s for sale) from sheep she used to have on her 36 acre farm. Although they no longer keep the animals they used to have she has plenty of wool and yard that she spun and dyed herself. The wool she has for sale is 50% wool from her sheep, 50% alpaca from the former farm in North Creek and 100% Adirondack! It’s very soft and comes in some amazing colors. In addition to these beautiful yarns she sells she makes any number of articles of clothing, one of my favorites is called a chill-chaser, and when time permits teaches all of these skills. Not to be outdone her husband, Bob Adams is an equally amazing artist. His carpentry skills are top-notch. The table and the beautiful cabinet that are in the yarn and fiber store were made by Bob right there at the farm. Make sure you ask Donna to roll back the protective placemats to see the table, it’s worth a look. In addition to the furniture Bob has made he has also made a lot of the products that Donna sells in the store. There are looms of various sizes for the beginner weaver to the experienced weaver. 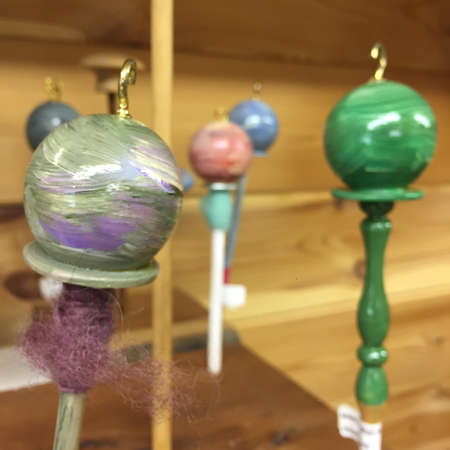 Knitting and crochet needles, as well as drop spindles that are tole painted by Donna herself, are also hand made by Bob, and can be purchased right there at the store. Everything you need for your next project is available at the store. I love crocheting and all of the things that go along with it but the thing that will make me want to go back over and over is the greeter, Cosmo. Going to a craft store is awesome enough but add this handsome dogger into the mix and it’s just about perfect! I wouldn’t mind sitting on the porch crocheting the day away with his handsome face! Construction plans for a spur trail from the Northville-Lake Placid Trail connecting to the center of Long Lake is slated to be finished by the fall and ready for use in 2018. The connector trail connects with the Three-Brook Loop Cross Country Ski Trail giving hikers an option for a short-cut into the village of Long Lake go into the town for a stop at the Post Office (located at the base of Mt. 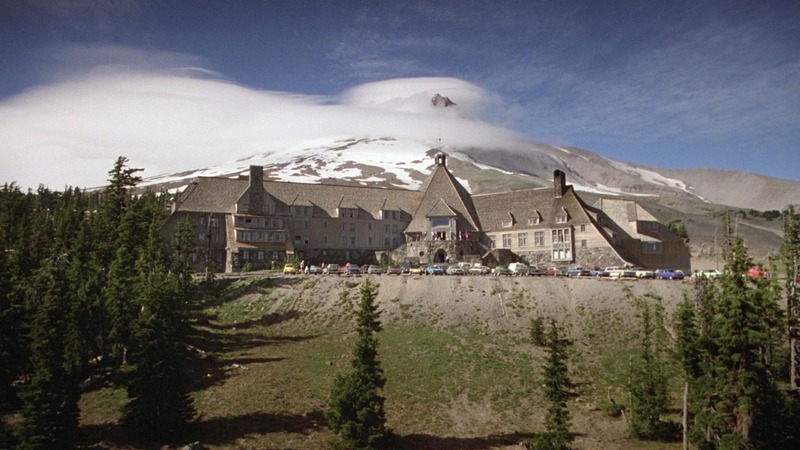 Sabattis) eat and even take advantage of multiple lodging options in the commmunity. The spur trail will potentially save a lot of hoofing along route 28N, a busy travel corridor between Long Lake and Newcomb. This gives hikers traveling from the south end of the trail from Blue Mountain a much more convenient opportunity to pop into town for a rejuvenation stop for food, sleep, and replenishment of supplies. The section of trail will be partly on state land and partly on property owned by the Town of Long Lake. 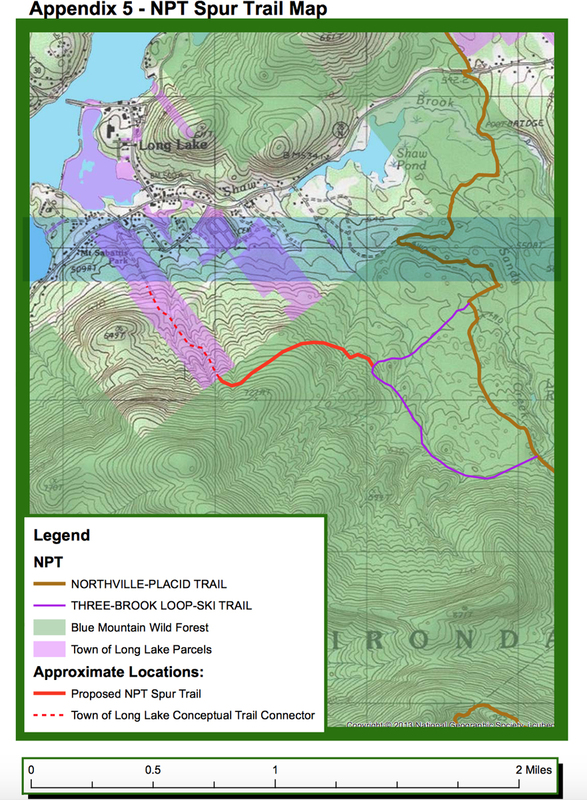 For those hikers not looking to come into town, there will be a bypass to continue on to the northern section of the Northville-Lake Placid trail and avoiding the drop off into town. 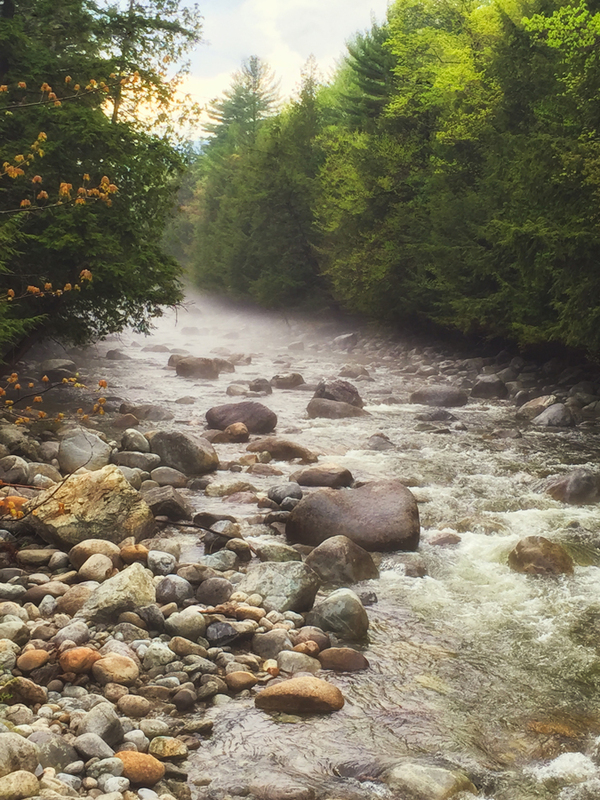 This is part of The Adirondack Community-based Trails and Lodging System and the Hamlets to Huts project. 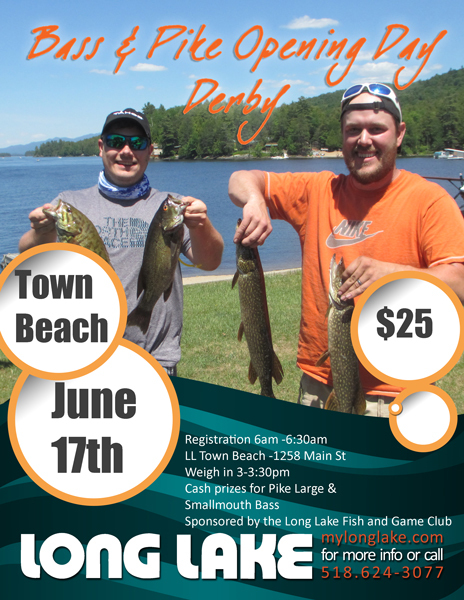 Long Lake Annual Bass and Pike Opening Day Derby will be on Saturday, June 17th with launch from the Long Lake Town Beach, located at 1258 Main Street. Registration is held from 6am – 6:30am and is $25 per person. Cash prizes are awarded for fish caught in Long Lake including Pike, Largemouth & Small mouth Bass. Weigh in is 3pm – 3:30pm at the Long Lake Town Beach. Equipment also available at the ADK Trading Post. 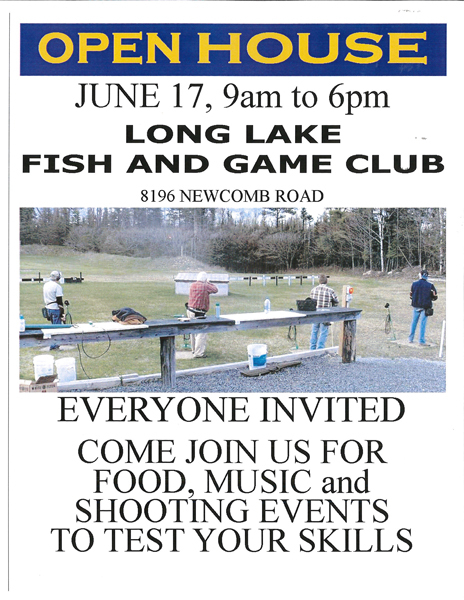 Also on June 17th from 9am – 6pm the Long Lake Fish & Game Club will be hosting an Open House at 8196 Newcomb Rd. 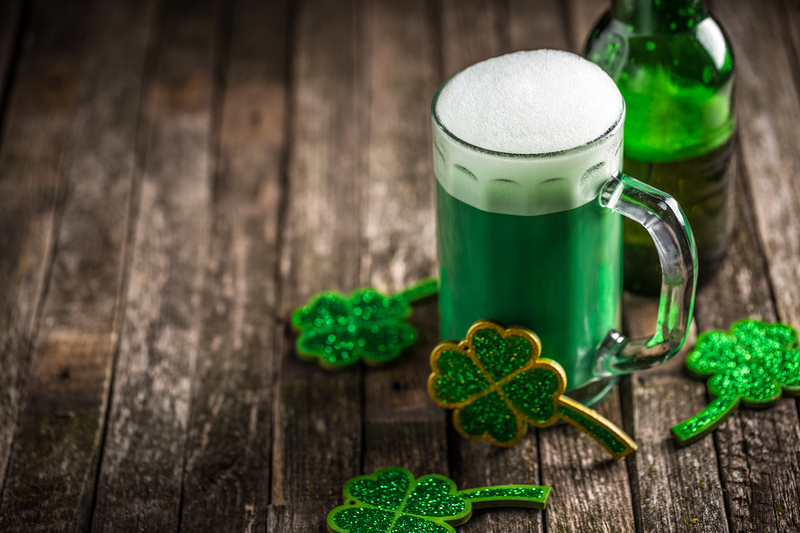 Food, live music and shooting events will be on the docket. All are welcome to attend and check out the expanding facilities. A great day of recreation and sporting events in Long Lake, NY in the heart of the Adirondacks. 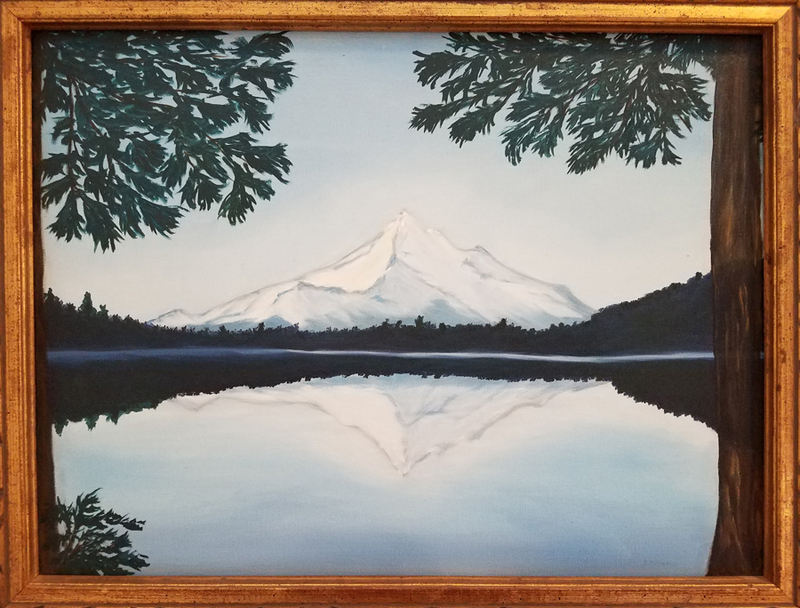 Blue Mountain Lake, NY: The Adirondack Lakes Center for the Arts announces its annual Members’ Show now on exhibit through July 1, 2017. In addition, works by two sisters, Laurinda Minke and Louisa Wright, are on exhibit in the Arts Center’s second-floor galleries. A reception and artists’ talks for all three exhibits will be held on Friday, June 30, 2017, from 4 to 6 p.m. The reception is free and open to the public. The Members’ Show is open to all Arts Center members who wish to display up to two pieces of their work. The 2017 exhibit includes the following artists: Frances Armstrong (rustic mirror), Fred Holman (abstract), Beverly LaBarge (gourd), Chip Perone (photography), Elizabeth Pinaha (oil), Al Pouch (reliquaries), Laura Smith (handmade purse and stash book), Eve Whalen (watercolor and charcoal), Raymond Whalen (mixed media and ceramic) and Joseph P. Wild (photography). 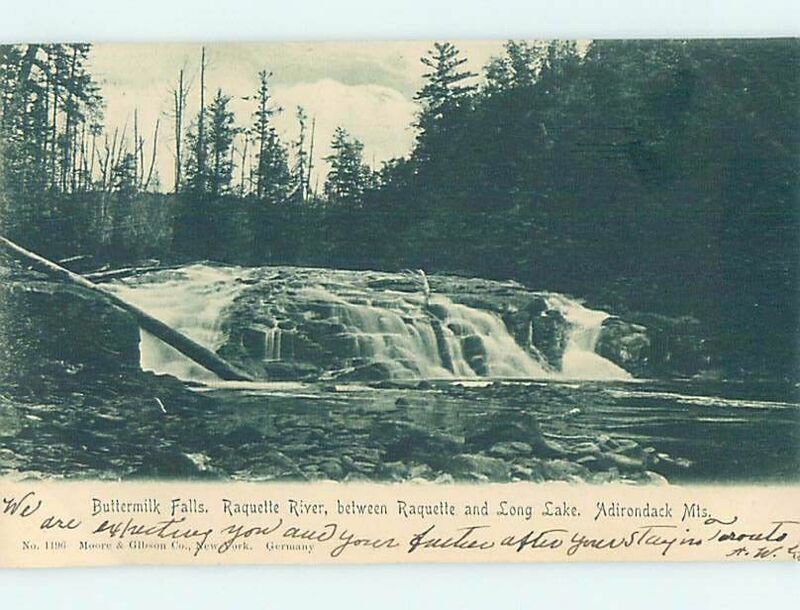 Minke’s Adirondack Musings includes more than 20 photographs of some of the Adirondacks’ most iconic images and locations including loons, whitetail deer, and views for Santanoni, Tahawus, and Long Lake. 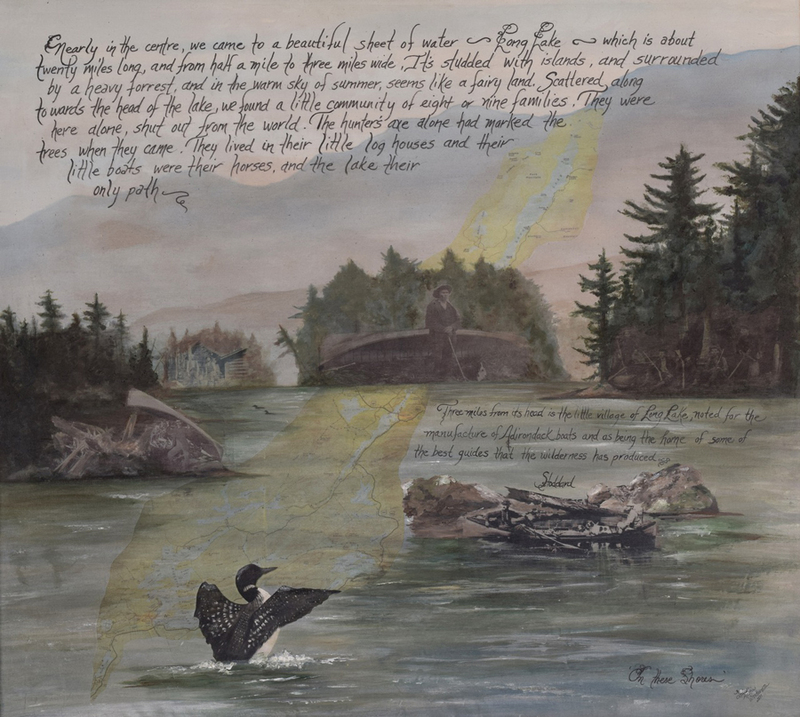 Wright’s mixed media Native Song depicts natural and repurposed elements, words, and quotes to share her deep connection to her ancestors and the Adirondacks with others. The Arts Center, located at 3446 State Route 28 in Blue Mountain Lake, is open 10 a.m. to 4 p.m. Wednesday through Saturday through June 25; the Arts Center will be open Monday through Saturday beginning June 26. The Adirondack Lakes Center for the Arts is celebrating its 50th season! Visit www.adirondackarts.org for the most up-to-date information about performances, workshops, gallery exhibits, programs, and special events. The Arts Center is generously supported by grants from the New York State Council on the Arts.